The second part of this blog series examines the IEEE standards and government regulations that impact channel bonding. Channel bonding has become a very useful mechanism for accommodating growing WiFi data capacity requirements. But as I explained in my last blog, the laws of radio frequency physics can make channel bonding challenging to use in practice. In this post, I discuss the impact of IEEE standards and regulatory restrictions on channel bonding, and how this makes the use of channel bonding even more complicated. In the IEEE 802.11a and 802.11g WiFi standards, channel widths were strictly defined as being 20 MHz in size. The number of independent channels varied by country, but most regulatory domains allowed for at least three channels on the 2.4 GHz band (802.11g) and at least five channels on the 5 GHz band (802.11a). 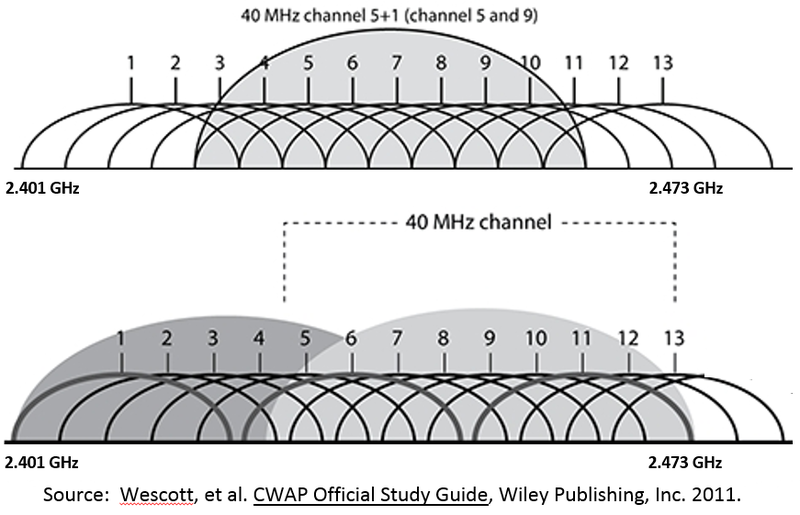 Channel bonding was first introduced with 802.11n to allow 40 MHz channels, and then ultimately extended further with 802.11ac to allow 80 MHz and 160 MHz channels. As mentioned in my last blog, the size of the usable frequency band for WiFi per regulatory domain (i.e. country) is fixed. Accordingly, mathematics dictate that when the size of each independent channel is doubled, the number of available independent channels is halved, rounded down. While simple enough to understand, the laws of mathematics wreak havoc on the 2.4 GHz band when channel bonding is applied. The usable frequency band for most of the world on the 2.4 GHz band is only 72 MHz wide (2.401 GHz to 2.473 GHz). Accordingly, there are only three independent 20 MHz channels, and it is mathematically impossible to have more than one independent 40 MHz channel. In contrast, the 5 GHz band has up to 500 MHz in the US, providing up to 25 independent 20 MHz channels, as opposed to only three independent channels on the 2.4 GHz band. I say “up to,” however, because this band is only semi-contiguous; many regulatory domains and the historical evolution of FCC regulations of this band make it much more complicated to use, especially when bonding the channels together. Nearly half of the frequency range of the 5 GHz band requires dynamic frequency selection (DFS), a process by which the access point must detect the signature of existing government weather radar and other radio systems and vacate the channel for an hour. If a particular WiFi network is located in range of such an existing radar system on a DFS channel, the particular DFS channel is unusable at that location, and channelization must be redone to avoid that specific channel. In March 2014, the Federal Communications Commission (FCC) extended DFS detection requirements to apply to client devices as well. Unfortunately, many WiFi consumer device and appliance manufacturers, driven by cost and time-to-market constraints, took the easy way out: simply do not operate on any channels in the DFS channel range. This significantly limits the practical number of channels available if those client devices are on the network, especially when channel bonding for larger channels. But don’t worry: All of your Apple and virtually all of your Android smartphones and tablets currently support operation on DFS channels. The problem is with low-end laptops and wireless USB adapters, which will revert back to 2.4 GHz operation if they cannot see a 5 GHz signal because the AP is using a DFS channel. 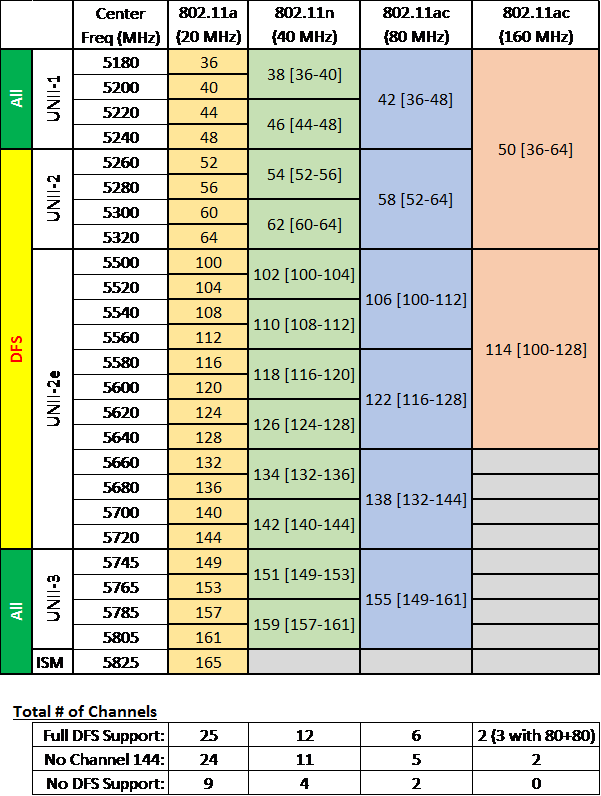 The following table shows the full range of 5 GHz channels for different channel sizes. UNII-1 (Channels 36 – 48, 5.170 – 5.250 GHz): This 80 MHz wide band historically was regulated by the FCC for low-power indoor use by WiFi, but is currently allowed for both indoor and outdoor WiFi at the same power levels as all other 5 GHz channels. Most regulatory domains worldwide allow WiFi operation in this band. All 802.11n and 802.11ac client devices can use this band. UNII-2 (Channels 52 – 64, 5.250 – 5.330 GHz): This 80 MHz wide band historically was reserved by the FCC for government weather radar systems, so DFS sensing is required by access points and client devices. Most regulatory domains worldwide allow WiFi operation in this band. Only higher end 802.11ac client devices and older 802.11n client devices support use on this band. UNII-2e (Channels 100 – 144, 5.49 – 5.730 GHz): This 240 MHz wide band also was reserved by the FCC for government weather radar systems, so DFS sensing is required by access points and client devices. To complicate matters further, Channel 144 was only added for WiFi use in 2013, with the emergence of 802.11ac, in order to support an additional 80 MHz channel. Hence, older 802.11n client devices and some access points do not recognize and therefore cannot operate on Channel 144. Furthermore, several worldwide regulatory domains don’t allow the use of this band. Only higher end client devices and older 802.11n client devices support use on this band. UNII-3 (Channels 149 – 161, 5.735 – 5.815 GHz): This 80 MHz wide band was historically designated by the FCC for both indoor and outdoor WiFi use, though several worldwide regulatory domains do not allow WiFi in this band. All 802.11n and 802.11ac client devices support use on this band. ISM (Channel 165, 5.825 – 5.845 GHz): This 20 MHz wide band is also allowed by the FCC for WiFi, though. several worldwide regulatory domains do not allow WiFi in this band. All 802.11a, 802.11n, and 802.11ac client devices can use this band, though this band is not used when larger channel sizes are deployed. The FCC is considering the addition of additional 5 GHz spectrum, including the 5 MHz between the UNII-2e and UNII3 bands as well as adding additional channels (i.e. 68 – 96 and above 165). Given that there are more government systems currently using those frequencies and the general speed of decision making, do not expect to see any further expansion of the channel space in the next three to five years. Even if additional spectrum is made available, DFS or similar restricted use of these expanded frequency bands will likely apply. So where can you actually use these larger bonded channels? I'll discuss that in my next blog. Learn about wireless infrastructure and supporting the mobile enterprise in the Wireless & Mobility Track at Interop Las Vegas, May 2-6. Register now!